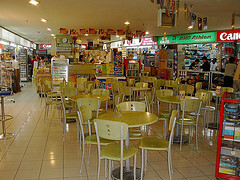 Imbi Plaza is very close to Sungei Wang Plaza. It faces Jalan Imbi as well as the Imbi Monorail Station. For quite a long time, it had the reputation of being the most popular complex that sold IT merchandise. Now that Low Yat Plaza has come onto the scene, it seems that bleakness has once again settled around the older shopping mall. 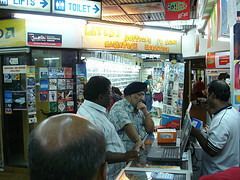 Low Yat Plaza is the largest shopping center in Malaysia and sells plenty of IT merchandise. You will still get people to shop at Imbi Plaza. However, there are no real sales or bargains to draw people to the stores. The only die-hards that will frequent this mall are the real bargain hunters that are on the prowl for great deals! Shoppers who come here are looking for cheap values, especially gaming consoles such as PS3, Xbox 360 and the Nintendo Wii. So lets see what exactly it has in the Imbi Plaza complex. Only three levels make up this mall which are levels LG,G and L1. Each level is very small. Skimming the shops will take you no time at all! After you have made your way around the Plaza and have gotten comfortable with the owners and sales reps., then your job is just about to begin. You already know what kind of prices they have just by previously shopping there. Their prices are most reasonable yet Low Yat Plaza does sometimes offer some things a bit cheaper. If you find something you really want, then haggle with the owner or manager. You may be pleasantly surprised when the price is dropped! Check everywhere for the lowest price that you can get. You may even take a flier back to the original place where you first saw the item. If you show the owner that you can get the same piece of merchandise cheaper, then the owner may just oblige you and drop the price. The next question out of your mouth will be, How do I get there? In order to get to the mall entrance, you may either enter by way of Jalan Imbi, then make a right turn and you are there. By LRT  Get off at the Hang Tuah LRT station. Then walk for about 15 minutes. Make sure you go east along Jalan Hang Tuah and then you want to cross Jalan Pudu and continue to walk on to Jalan Imbi. By Monorail  Get off at the Imbi Monorail Station or wait until you get to the Bukit Bintang Monorail Station. From there, you may obtain a map pointing you in the right direction. By Taxi - If you find a Kuala Lumpur Meter Taxi, just tell the driver to take you to Imbi Plaza. By Bus - These buses all apparently go the same way. Imbi Plaza must be somewhere on their call list! When you get to the bus stop, leave the bus and go to the McDonalds in front of BB Plaza. After that, refer to the map that was given to you. You will find that you are able to walk to any complex that you wish to visit.